Santa Fe is one of the country’s most famous walking cities. There is so much to do and see in Santa Fe, and walking around can be one of the best ways to get your lay of the land. With our expansive turquoise skies and endless sunny days, we can’t think of a better city to explore on your own two feet. 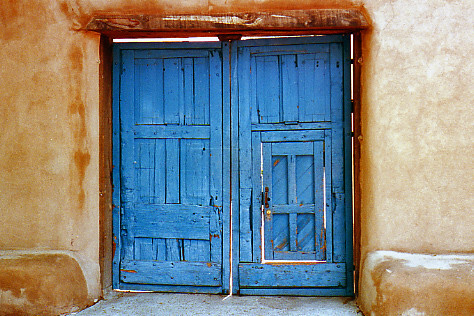 Hit the streets with a knowledgeable, fun and friendly guide, or walk Santa Fe at your own pace. Try a fun and informative walk with a local professional historian, where you’ll learn about the fascinating history, art and architecture of our unique city. You’ll maybe even hear a spine-tingling ghost story or two. 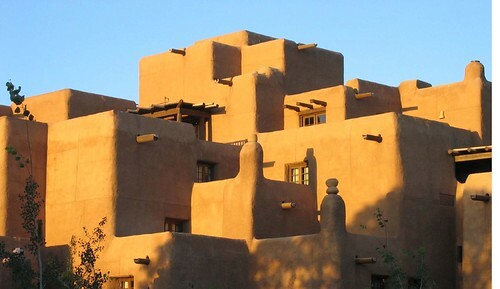 Or simply meander through the winding streets to admire the charming adobe shops, homes and historic buildings along the way, as you create your own Santa Fe tour. It doesn’t matter what you’re in the mood for; you can find it in Santa Fe. 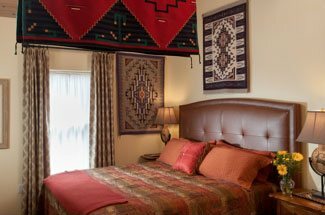 Our luxury Santa Fe Bed and Breakfast is situated perfectly near the historic center of town. Book your room with us now, and take this opportunity to enjoy one of our many walking Santa Fe tours. 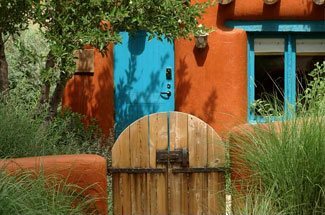 The Santa Fe Convention and Visitors Bureau has put together some wonderful walking itineraries, allowing you to take charge and create your personal Santa Fe tour. For example, come and experience why Santa Fe is a coffee lover’s paradise on our Coffee Lover’s Tour. Once you’ve had your cup of Joe, head out on our great Literary Landmarks Tour. From the 1920’s to the 1940’s, Santa Fe was home to a literary colony inspired by the natural landscape, famous for producing an array of articles, essays, and poems. Among the famous authors from this colony Willa Cather, Mary Austin, and British novelist D.H. Lawrence. On this great Santa Fe tour, visit the homes and gathering places of these writers, and experience the legacy of Santa Fe’s golden literary era. Revel in the stunning art legacy of Santa Fe when you take the New Deal Art Legacy Tour, where you’ll see how artists in New Mexico were able to survive during some of the hardest times in America’s history. Or maybe you’re in the mood to end your day with something sweet. If that’s the case, then the Chocolate Lover’s Odyssey, where you’ll explore Santa Fe through the tantalizing tastes of artisanal chocolates, is perfect for you. Many of these tasty treats use organic ingredients native to New Mexico, including chile, pinon nuts and lavender. Where else but on this wonderful tour can you enjoy a steaming mug of historic European and Meso-American Aztec drinking chocolate? If walking around our beautiful city doesn’t sound appealing to you, then there are plenty of other Santa Fe tours for you to choose from. Climb aboard the Santa Fe Southern and travel in vintage railroad cars to the historic depot in Lamy. Better yet, get out into the great outdoors, and take a guided horseback, motorcycle, fishing, river rafting or snowshoeing tour. If you’re seeking a true adventure, then we suggest going trekking into the wilderness around Santa Fe with a llama to pack your gear. This one of a kind trip will take you into cliff dwellings and pueblo ruins, exploring the past of Santa Fe like only true adventurers can do. There truly is a Santa Fe tour to fit every style, and we look forward to your stay with us as you experience life in The City Different.